Slimline or Full Fat? Cucumber or Lemon? Lady M Insists! After the disasters of the Battenberg and cupcakes, one sharp eyed colleague questioned whether Sally really was that bad at cooking. Referring to Mmm…No1…Cookbook on Amazon she said, ‘Didn’t Sally help you to write your [best selling] cookbook?’ Of course she did, she took the photo for the front cover! Ole has a new job at PaperEscape in Chinley. It was not a great beginning as he rose bright and early for a 9am start. Unfortunately he was supposed to there at 8! He has started going to the gym regularly, and eating healthily, at least whilst he is at home. However, it seems that once he is out of reach of home cooking the Whaley Kebab House is his favourite haunt. So much so that they even let him run up a tab until his pocket money got paid into his bank. Zac, meanwhile, has also started going to the gym. Me: What have you been doing? One thing I am sure of is that he will be disappearing for the next few weeks as the Beta edition of his new game morphs into the full blown version. I suppose I should get my own Xbox account to keep in touch with him. There have been a few experiments in the kitchen, including chicken, pasta, bacon and spinach in a creamy sauce, and praline cake which is very, very hazelnutty. At first I thought that this was a healthy alternative to other chocolate cakes, but it isn’t really! Although it contains no flour or butter, it does contain whipped cream, dark chocolate, and rather a lot of Nutella. I also started Christmas preparations with Creole cake. The fruit was steeped in alcohol for week and then the cake was baked. This week I gave it its first feed, with numerous injections of brandy. Next week it will be port, then rum, then whatever comes to hand! Another successful experiment came in the shape of pumpkin pancakes. It always amuses me that people get excited by Halloween and pumpkin season, then post recipes stipulating canned pumpkin. These were definitely made with fresh pumpkin, and they were delicious. 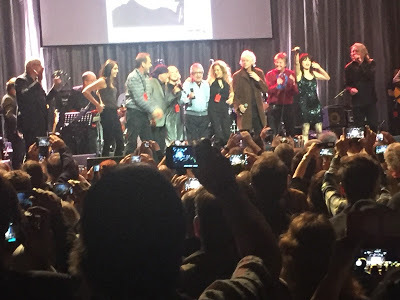 Had an interesting trip to London last weekend to see Bill Wyman’s 80thbirthday concert at the Indigo Theatre in the O2. We waited for the train at Macclesfield, and there was an announcement saying that seat reservations did not apply. That seemed a bit strange, but we soon found out why as the previous train had been cancelled and this one had to accommodate twice as many passengers. When the doors opened there was simply no room to get on. Undeterred, Lady M headed straight for first class. We got on there quite easily, then she proceeded to rearrange a few passengers so that we could sit together. Quite nice in there, particularly when the free drinks came along. Anyway, the train announcer kept saying that everyone should complain to get their due compensation, which seemed a bit harsh as we appeared to have gained a free upgrade. But, in for a penny, as they say, so I got on the Virgin Trains website and soon realised what I would be up against. My message went to Virgin Trains Customer Support, and I got a helpful email stating that I should contact Virgin Trains Customer Relations. Would have been really helpful if you could have passed on my complaint to the relevant people, but maybe that is indicative of the very poor customer service that I am coming to expect from Virgin trains. So, Virgin Trains Customer Relations, (as opposed to Virgin Trains Customer Support) do you need me to email you separately or are you bright enough to be able to extract the info from this email? I would like to inform you that I have forward your request to our Customer Relation Department, they will investigate and will revert to you. I hope this information is helpful, If you have any further queries, kindly do not hesitate to contact us. Anyway, at this point I had not touched a drop. We disembarked at Euston, and after a pitstop for Prosecco and nibbles at M & S we hit the tube to North Greenwich. I’ve never particularly liked the tube, but at least now it is Contactless which makes it easier. We followed the crowds, then realised they probably weren’t all going to the O2 so we checked a map. We boarded a tube for Tower Bridge, where we changed to the Jubilee Line. We arrived at North Greenwich having shared public transport with a totally miserable set of travellers. Its as if everyone is scared to smile on the underground, but we had a much more pleasant journey on the return. We walked around the O2 to our hotel, which was very nice, but there was something about the service that wasn’t quite right. Check in took about 15 minutes. That’s a long time. Something to do with my loyalty card, and they wanted to ensure we were in a double rather than a twin room. After our ordeals to that point we headed across the reception to the nearest bar, and although there were a lot of staff milling around, none of them actually seemed to be serving. Eventually we got a bottle of Peroni and a large G & Slimline T, complete with a huge slice of cucumber. I don’t mean a horizontal slice. This was a vertical 4-5 inch slice, and Lady M was not impressed. She went in search of our waitress and insisted on lemon. The waitress remarked that cucumber was the more traditional accompaniment, but Lady M responded in a ‘Do you know who I am?’ kind of way, and the lemon was provided. We decided to head for the first floor where they had draught lager, and this time the waitress made the fatal mistake of pouring full fat tonic into the G & T! A very expensive mistake at London hotel prices, as Lady M insisted on a replacement. We eventually reached our room, a twin as it turned out, but we were too pissed to complain! We had a quick turnaround and then we headed for the Sky Bar on the 18th floor. Very nice, but again service was a bit slow. Next stop was the Indigo, which was a short walk from the hotel. This is a great theatre with spacious seating, generous walkways without bouncers telling you to sit down, and an expansive bar at the back that was open throughout the show. The backdrop to the stage showed pictures of Bill Wyman throughout his childhood and his career. As showtime approached this was replaced by a huge white screen containing a quote on rock and roll and music in general from Brian Jones. ‘Do you think he will be appearing?’ Sally asked. ‘I wouldn’t have thought so,’ I replied. ‘He died in 1969.’ The show itself was fabulous, except for Mark Knopfler. I’ve never been his biggest fan, and when he launched into a 5 minute dirge at the start of the evening it didn’t augur well for the rest of the event. However, I needn’t have been concerned. Van Morrison was brilliant, as were Martin Taylor, Andy Fairweather-Low, Robert Plant and, surprisingly, Mick Hucknall and Bob Geldof. For me the star of the show was Imelda May who belted out a couple of numbers before joining Robert Plant for the finale. Apparently Harry Styles walked past us as we watched the show, but I didn’t recognise him and he didn’t recognise me. We staggered back to the hotel and hit the bar for a nightcap and a burger. It was a bit odd that all of the restaurants around the O2 shut as the shows finished, but the Clipper Bar came to the rescue. The burgers arrived, and were delicious, but would have been enhanced by a bit of ketchup for the chips. We asked, and we waited, and we waited. We asked again, and the bar man reached under his bar for a couple of pots of the red stuff. Why the waitress couldn’t have done that I have no idea. Anyway, the next morning we ventured out to get Sally some headache tablets, and after a gentle stroll along the Thames we boarded a Thames Clipper to take us back to the city centre. It was refreshing and blew the cobwebs away as we passed the Globe, the Houses Of Parliament, The Shard and many other famous landmarks before getting off at the London Eye. A quick cab ride took us to Euston where Gino D’Acampo served up a lovely bacon butty and coffee. The return train journey was much less of an adventure than the outward one. Ahhh, KLM! You may recall that I had a cancelled flight back in July, and because of the unholy alliance between Delta, Virgin and the Royal Dutch carrier it was down to KLM to sort out the refund. I had the option of a £670 voucher or £503 cash. I opted for the cash. And submitted my details on the unintelligible KLM website. I wasn’t overly concerned as they stated that all refunds would be paid back to the card that paid for the original flight. That was on 15th September, and it would be paid within 20 days. On 27th I was assured that the refund would be processed in good time. On 10th October I was sent confirmation that they would transfer the money to my account. On 19th they informed me that they had completed the transfer but it hadn’t gone through because the IBAN was incorrect. I told them that the IBAN code was for my credit card account and that the credit card number should be used as the reference, otherwise it would not be recognised. It then went a bit strange! Due to unforeseen circumstances, we were unable to answer your inquiry in time. Please accept our apologies. Your refund is on its final stage of being wired to your account, it took a longer period to refund due to the high volume of refunds to be handled. I took a look at the request and noticed that it was already handled on 10th October, but the payment was rejected by your bank. Could you maybe check with your bank why the payment was rejected, please? I will also check with our payment department here for clarification, and will let you know as soon as I receive their answer. I apologize for the inconvenience and hope for your patience. · Rogier R: Hi there! · Rogier R: Did you also receive a refund request ID? · Me: I received that on 15th September. 29 days ago! · Rogier R: You didn’t receive this yet? · Me: I understood you would only transfer it to the account from where the original payment was made. The IBAN code for this is probably that of my credit card provider – not my personal bank account. Any suggestions what to do next? · Rogier R: Is the above correct? · Me: That is the bank account for my credit card provider (Tesco). Without a reference they would not be able to direct it to my account. The reference would be my credit card number (used at the time of payment). · Me: Ok – do you have a payment reference? · Rogier R: Would you be able to send us a message via Facebook? · Me: Yes – I tried yesterday via Twitter and got no response! · Rogier R: That’s strange. May I have your Twitter name? We will investigate this further and revert shortly, Mike.We have read through your conversation and are apologize for not being to pick your message from our twitter account. Stay put, we will be contacting you soon. Still here and still waiting…. Mike, your file is currently under review and we appreciate your patience in the mean time. Rest assured we’ll get back to you when we have more information and should you have any other questions, please don’t hesitate contacting us again. Nothing as of now, Mike. Please be assured that we will be in touch with you as soon as we know of any new updates. What is your estimated completion? Or do I need to escalate? We can see that GBP 503 are approved to be refunded to your account. It’s the matter of transferring the money. Please feel free to send us the details and we can check if we have the right ones on hand in the file. Your information is well received, Mike. We have forwarded it to the concerned department and they will do the needful. Should you have any further concerns or queries, just let us know, as we’re more than happy to assist. Great thanks – just ask them to keep me informed! Hmmm – nothing yet – and not much communication. Your customer service rating drops by the day! As soon as we will have news, we will get back to you. Hello, Mike. We will immediately check this for you and get back to you at the earliest. We appreciate your time and patience. I will be escalating this through management and social media. You are an absolute shambles. Your website clearly states 20 days. My ‘patience and kind understanding’ has now run out. My next step is to file a legal claim which will incur interest and expenses on your part. We are sorry you feel this way, Mike. Please keep in mind that we are doing our best to resolve this issue for you at the earliest. Your utmost patience is very much appreciated. Frankly, your best is proving to be not good enough. Look back at all of the messages you have sent me (Messenger and email) including the assertion that it is ready to go it just needs to be transferred. Remember, this is for a flight that was cancelled! So you (or Delta) have already screwed me once! This is compensation for that and you cant even get that right. I will give you 3 more hours (until 12 noon UK time) before I file a legal document. Then you will incur charges and interest. We have spoken personally to our Refunds Department, Mike. We immediately sent a follow-up and we have been informed that they are all looking into this. We’ll get back to you proactively about this. We would like to humbly seek for more patience. Same old story! Patience expired. Haha – now your Twitter team have responded. Shame your accounts team havent sprung into action. My legal counsel is standing by. Would you like her contact details? BTW – she is expensive! We certainly understand the situation, Mike. Rest assured, our Refunds Department is currently working on this. We will get back with an update as soon as possible. For your information this was emailed to me and submitted on 19th October! Can someone just give me a call to discuss how we can get around your ‘issues’? Your customer service is appalling. I have been told that the delay is because there are a lot of refunds to process, the IBAN was incorrect (which I corrected), and now you tell me that my payment was rejected 17 days ago. That’s hardly news! @klm_uk How come you say allow up to 20 days for a refund but really you seem to take as long as you want? @KLM_UK I have been personally assured that you are doing everything – but its simply not good enough. @KLM_UK BTW – the fact that you spelt my name incorrectly does not exactly inspire me with confidence! …..
@Tumbattle >> request we see that you would still need to wait for some more time as the file is still in process. @KLM_UK finally, whilst I applaud comms via social media when is someone going to pick up the phone and tell me exactly what the problem is? @Tumbattle >> has been marked for approval. So, its at the final stage of the processing. Thank you for understanding. @Tumbattle << only be a matter of time until our Refund Team will contact you. Please bear with us a little bit more. Thank you. I am sorry that it is taking so long to get your voucher refunded to you. Could you confirm if the below details are correct, please? These are the details our refund department is using now that they try to process the payment again. Once again, I apologize for all the inconvenience and look forward to your reply. On 3rd November I got a familiar email telling me that £503 would be refunded to my bank account. We recommend that you check your statements for this period. Ten days! WTF? Do they have to print the money? for your request BEF-4DE674B2E186. They confirmed that everything should go fine this time. I hope to have informed you sufficiently and I am really sorry that it has taken so long time. If you have any questions, feel free to reply to this e-mail. Accounting Office in your city / country. Contact details in the footer below. So is that as well as the previous correspondence? I hope so. If they pay me twice I’m really going to have some fun! I guess it’s a good thing for KLM that I am not a hormonal woman. As Zac rather plainly put it, ‘Yeah that’s why I sometimes get sent out of class for no reason, because the teacher’s having a period’.